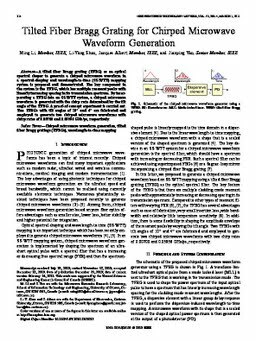 A tilted fiber Bragg grating (TFBG) as an optical spectral shaper to generate a chirped microwave waveform in a spectral-shaping and wavelength-to-time (SS-WTT) mapping system is proposed and demonstrated. The key component in the system is the TFBG, which has multiple resonant peaks with linearly increasing spacing in its transmission spectrum. By incorporating a TFBG into an SS-WTT system, a chirped microwave waveform is generated with the chirp rate determined by the tilt angle of the TFBG. A proof-of-concept experiment is carried out. Two TFBGs with tilt angles of 10̂ and 4̂ are fabricated and employed to generate two chirped microwave waveforms with chirp rates of 0.00700 and 0.05956 GHz/ps, respectively.